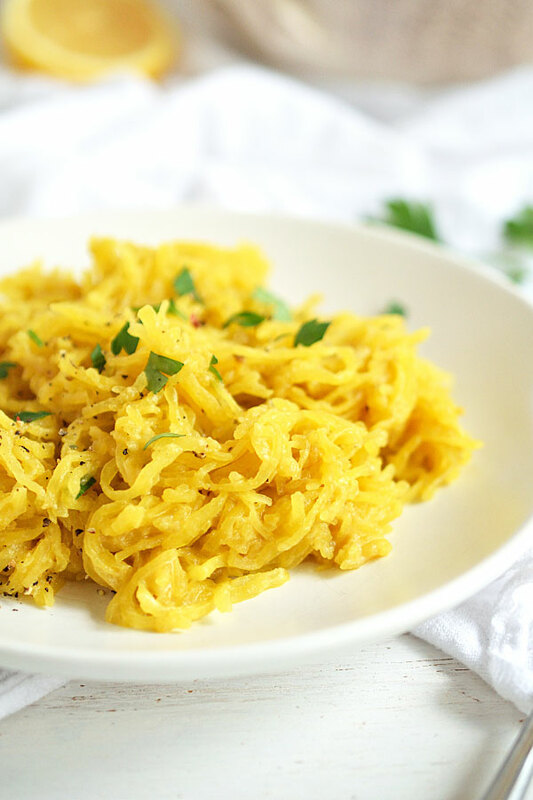 This cheesy spaghetti squash dish couldn’t get any simpler… or delicious for that matter! It’s only 4 ingredients, whole-foods based, dairy-free, gluten-free… and absolutely yummy!! Its so cheesy, but *hint, hint* no cheese here! I use nutritional yeast, a little lemon juice, and cumin to make this rich and cheesy pasta. 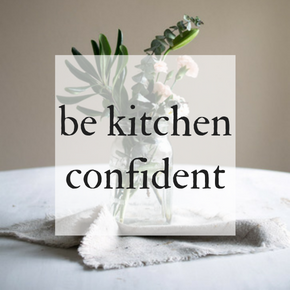 The key though, the simmer… simmering the squash in a little water so the squash breaks down and the sauce becomes creamy and thick… So perfect! You may not think from how I eat now, but growing up I was a refined-carb, white bread and noodle gal. 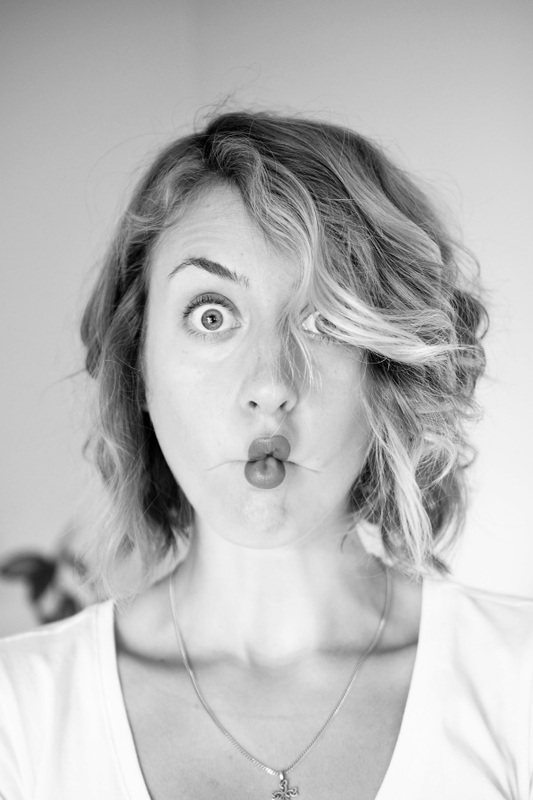 I thought of myself as “the bread queen”… how time as changed as I’ve learned more and more about food and nutrition. 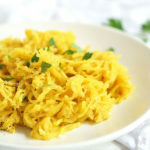 It left me not feeling too good, bloated, and all that… such a gnarly beast that refined food and processed sugar… But eating whole food and plant-based, spaghetti squash has become my go-to “pasta”! and it is SO much better! You won’t miss the refined pasta and you’ll FEEL so much better! 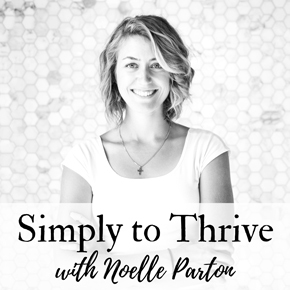 Rather than heavy and lethargic it’ll leave you light and energized. It’s such a serious nutrient-dense food, being low in calories but full of minerals like calcium, magnesium, and potassium, and vitamins like vitamin A and folate, fiber and even protein! This dish, with the nutritional yeast, such a truly nourishing dish! 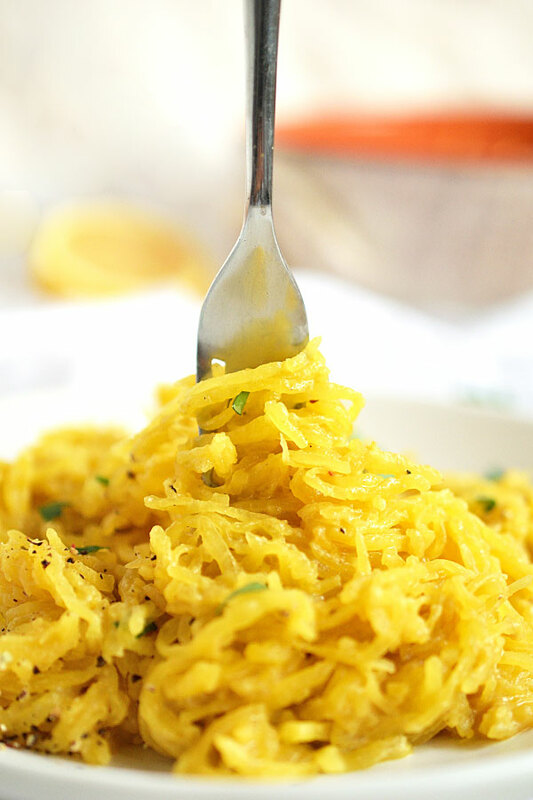 Seriously, can I just say that spaghetti squash is one of the coolest foods out there. God is just too awesome with all of His amazing creations! I mean really, how fun is this squash?? Scraping it up into those little noodles just never gets old! 😉 Going with the whole, plant-based version is always best, and you don’t have to think about eating “too much” or counting calories. Just eat the way we were designed! 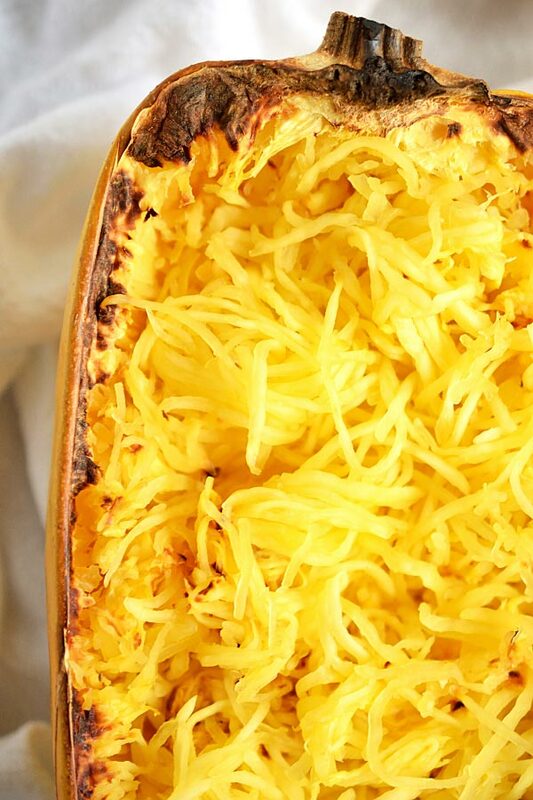 Scrape the cooked spaghetti squash into a cast iron skillet or Dutch oven (or other pan). Cover the bottom of the pan with enough water to be about an inch thick. Add in the nutritional yeast, lemon juice, cumin, and a pinch of salt and pepper. Regarding amounts, a good place to start (for one small or 1/2 of a large squash) is about a quarter cups worth of nutritional yeast, the juice of half a lemon, and a few good shakes of cumin. If desired, add a small spoonful of miso. Mix well, cover with a lid, and simmer on medium-high for 15-20 minutes until the squash has slightly broken down and the water has thickened. This simmering is key for the dish to come together and have such a creamy texture.